Born from the close collaboration between the House of Duval-Leroy and the Association des Meilleurs Ouvriers de France – Sommeliers, this blend represents both excellence and a respect for tradition. Derived from the exceptional harvest of 2008, the Cuvee des Meilleurs Ouvriers de France – Sommeliers (literaly, the blend of the Best Craftsmen of France – Sommeliers, or the “Cuvee MOF” for short), is a great Champagne embodying the origins of the prestigious Premier and Grand Cru of the House of Duval-Leroy. Possessing an extraordinary elegance, this splendid creation presents a deep and bright colour and an aromatic flavour remarkable for its freshness, intensity and finesse. 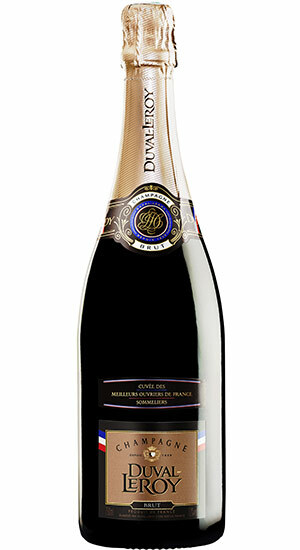 Aromas of white flowers, yellow fruits and brioche are accentuated by the fine bubbles. A remarkable unity holds together all the elements of this wine. The balance of taste is excellent and the precision of the acidity level gives extraordinary lenght, prolonging the enjoyment of the champagne.